The second of three IDFA titles to compete for the World Cinema Documentary jury prize is Ali Samadi Ahadi’s story of the Iranian political revolution of 2009, THE GREEN WAVE, a German/Iran co-production. In early 2009, a new generation of Iranians hoped for change through the upcoming presidential elections. Fueled by youthful exuberance and media technology, a groundswell—the so-called Green Wave—emerged to challenge the status quo, and caused a seismic shift in the political climate. A new brand of revolution seemed to be at hand. All polls predicted challenger Mir Hossein Mousavi would be the country’s next president; however, Mahmoud Ahmadinejad was declared the victor, prompting a backlash of unparalleled violence and oppression and a massive surge of human-rights violations that continues today. In this powerful and urgent documentary, filmmaker Ali Samadi Ahadi integrates animation with live-action footage, testimonials, and posts from courageous Iranian bloggers, who dared to tell the world about the anatomy of the movement and its devastating consequences. 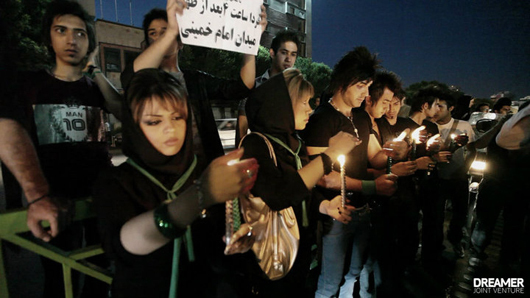 THE GREEN WAVE is a remarkable portrait of modern political rebellion, an exposé of government-sanctioned violence, and a vision of peace and hope that continued resistance may galvanize a new Iran. Iranian-born, German-based Ahadi and one of his producers, Oliver Stoltz, brought their previous documentary feature, LOST CHILDREN, to the 2005 Berlinale. It went on to win a German Film Award for outstanding documentary the following year. As noted in my profile of its fellow World Cinema Documentary Competition title, AN AFRICAN ELECTION, being able to bear witness to the empowerment and hope an election like this one can bring to its people is both inspirational and, in the case of Iran, devastating, given the repression that comes in its wake. Ahadi wisely balances the bigger picture with the reflections of individuals, personalizing the masses we’ve seen in viral videos and news reports in the process. For screening dates and times at Sundance, click the link in the first paragraph above. The film also has a website and Facebook page to keep interested audiences aware of upcoming screenings and other developments.